Mirboo North, a rural town, is in the Strzelecki Ranges, west Gippsland, 130 km south-east of Melbourne and 23 km south of Trafalgar. The heavily forested ranges were put up for farm selections in 1878. Three years later a survey began for a railway from Morwell into the ranges, and the terminus chosen was a village on a ridge that was accessed by a ridge-line road from Allambee (the Grand Ridge Road). The village, at first named Baromi, began with a hotel, c1882. Built in stages, the line reached its terminus in 1886. 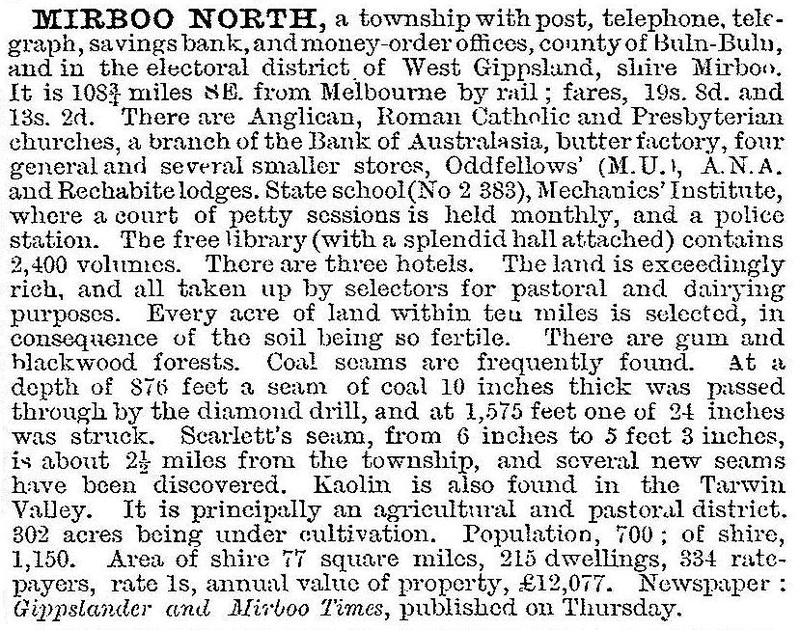 A town was surveyed in 1884, which in due course became Mirboo North. The reason for ‘North’ is that a town named Mirboo, about 12 km south on the east branch of the Tarwin River, had been surveyed in 1878. According to Bunce's Language of the Aborigines of the Colony of Victoria (1859), Mirboo is an Aboriginal word meaning kidney. Mirboo North soon became the principal town in its shire (1894), having the first school (1881), a two storey general store (1885) and a mechanics’ institute (1887). Dairy farming was the principal industry. After a period of local village creameries a dairy factory was opened in Mirboo North in 1893. The area of highest rainfall is north of Mirboo North, and annual rainfall drops by about one quarter south of Mirboo North. The southern farmlands suit sheep grazing, and Mirboo North’s railway yard was used for both dairy produce, cattle and fat lambs, railed to Melbourne and Newmarket. With a town population approaching 800, Mirboo North primary school was raised to higher-elementary level in 1920, and a new memorial school building was built in 1925. The town’s amenities were listed in 1933 in the Victorian municipal directory as including shire and Masonic halls, three churches, a court house, two coffee palaces, various sporting clubs, a swimming baths and a local newspaper. Not mentioned, but opened in 1931, there was also a bush-nursing hospital. The economic depression and World War II were a period for Mirboo North making do, but its first postwar year saw the beginning of an agricultural and pastoral society. Italian prisoners of war took up farms and potato growing increased. The Boolarra dairy factory closed in 1949 and more milk was put through Mirboo North. In 1955 the higher elementary school became a high school. Prosperity continued into the 1960s and early in the next decade a water-treatment plant was built for domestic water and water for the new swimming pool (1973). That, however, brought the good times into the doldrums with the railway line, butter factory and sale yards all closing during 1973-76. However, as the small bush schools closed some families moved into Mirboo North, and some Latrobe Valley workers chose Mirboo North over Morwell as a place to build their houses. Farming diversified and some marginal hill farms paid better as softwood plantations. In 1988 a brewery was started in the former dairy factory and in 2014 the Grand Ridge Brewery was fitted out with 384 solar panels in a plan to move the brewery to sustainable energy. Mirboo North sits attractively on the Grand Ridge. It has a community health service, State primary and secondary schools (268 and 346 pupils, 2014), four churches, a well-kept former shire hall (but without a branch office of the new shire), golf, swimming and bowls venues, a comprehensive shopping centre and a weekly newspaper. There is a Mirboo North-Boolarra rail trail.